This topic provides a short introduction to some useful queries for searching Packetbeat data. 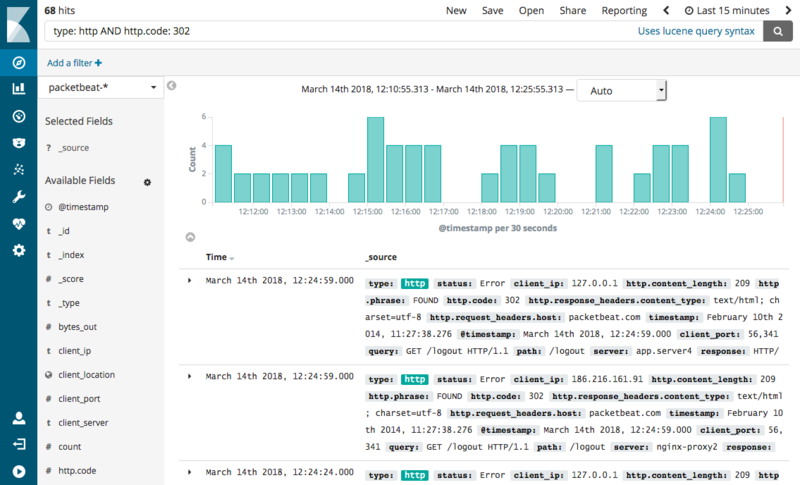 For a full description of the query syntax, see Searching Your Data in the Kibana User Guide. 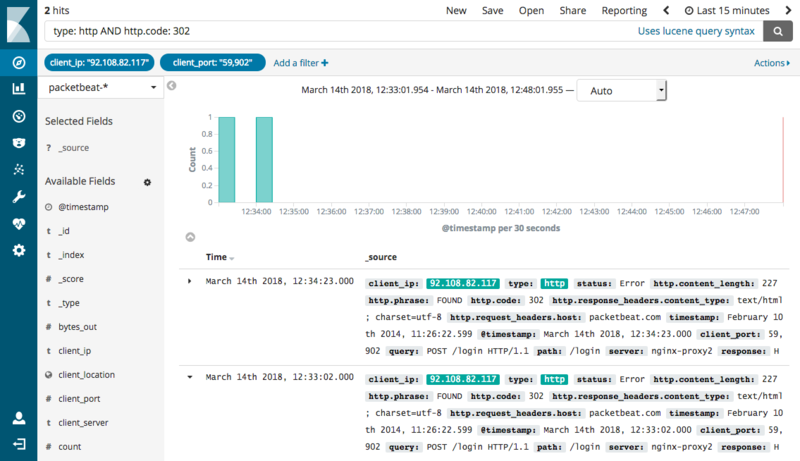 In Kibana, you can filter transactions either by entering a search query or by clicking on elements within a visualization. The search field on the Discover page provides a way to query a specific subset of transactions from the selected time frame. It allows boolean operators, wildcards, and field filtering. For example, if you want to find the HTTP redirects, you can search for http.response.status_code: 302. A query may consist of one or more words or a phrase. A phrase is a group of words surrounded by double quotation marks, such as "test search". "Cannot change the info of a user"
To search for an exact string, you need to wrap the string in double quotation marks. Without quotation marks, the search in the example would match any documents containing one of the following words: "Cannot" OR "change" OR "the" OR "info" OR "a" OR "user". Kibana allows you to search specific fields. See Elasticsearch regexp query for more details about the syntax. Range queries allow a field to have values between the lower and upper bounds. The interval can include or exclude the bounds depending on the type of brackets that you use. Boolean operators (AND, OR, NOT) allow combining multiple sub-queries through logic operators. Operators such as AND, OR, and NOT must be capitalized. Lucene also supports parentheses to group sub-queries. In Kibana, you can also filter transactions by clicking on elements within a visualization. 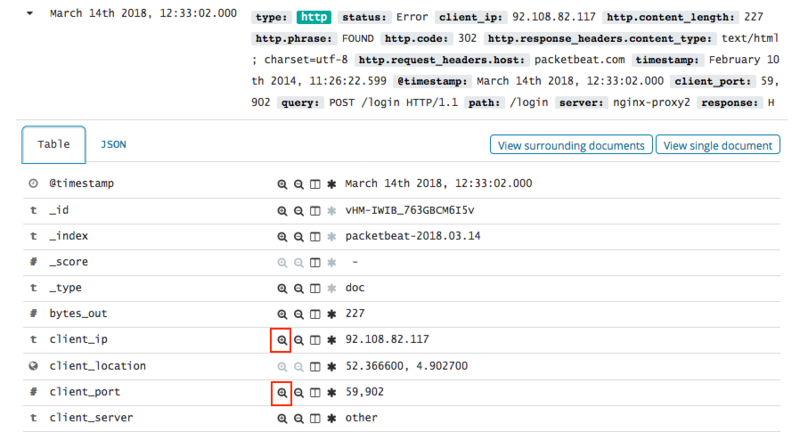 For example, to filter for all the HTTP redirects that are coming from a specific IP and port, click the Filter for value icon next to the client.ip and client.port fields in the transaction detail table. To exclude the HTTP redirects coming from the IP and port, click the Filter out value icon instead. The selected filters appear under the search box.